When we started getting really excited about lesser-known games, we would take them to some group events and watch them sit untouched. More familiar games like UNO, Scattergories, and Pictionary always took precedence. It was frustrating to play old standards when our new games offered something so different. Then we struck upon a formula. We lobby passionately that one of our games be played first. Usually (mostly likely out of politeness) people will agree with one round even when they're alreay shuffling the well-worn Skipbo deck. That first game then determines the course of the evening: Impress the crowd and your games will prevail. Lose the crowd and you might as well load the games back in the car. In your average family reunion type crowd, your kick-off game must be simple to learn, fast to play, and have a pretty even playing field. The themes cannot be quickly brushed off as a geeky, macabre, malevolent, or obscure (you're saving all that for later). 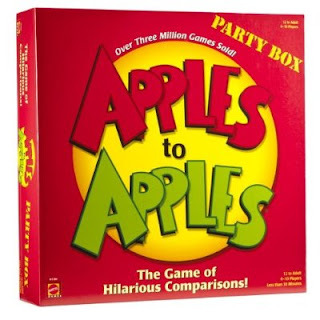 Apples to Apples is one of our favorite inaugural games. I can already hear the protests that Apples to Apples IS a mainstream game, but it started selling in the small game shops. Then it grew to wider availability. Any way, it's a game outside the Parker Brother's canon, so you're probably introducing people to something new(er) to them. It takes around a minute to explain and almost no time to set up (this makes it really to get out on the table first if you're trying to shanghai the crowd through speed). You set out a deck of green cards (adjectives) and red cards (nouns). Each player is dealt a hand of 7 red cards which they conceal from other players. The dealer then reveals the top green card. Players then select and submit a red card that embodies the green card's characteristic. The dealer chooses their favorite submission. The person submitting the chosen card wins the hand and keeps the green card until the end of the game. Everyone (everyone except the dealer) draws a new red card. The person to the dealer's left becomes the new dealer. Play continues until a player has won a certain number of hands (which varies with group size). One of the great things about the game is the unpredictability of the dealer's selection. While I tend to like abstract connections, other player may be more literal or ironic. The ability to assess each dealer's preferences offers advantage in the game. The change of dealer and comparison preference shakes things up a lot. Rarely does a single player dominate the entire game. To speed the game, we play with the variation that the last person to submit a card is not allowed to compete in that hand. So, with a group of 6 players, only 4 cards would be accepted (neither the dealer nor the slowest player contribute). This keeps the overall pace brisk and adds the thrill of speed and movement to each play. Recommended retail price is $26.99. This game is awesome! Thanks for introducing it to us! I highly recommend it! Fun Paranoia: Playing "Are You a Werewolf?"